What Keeps Newt's Bid Alive? 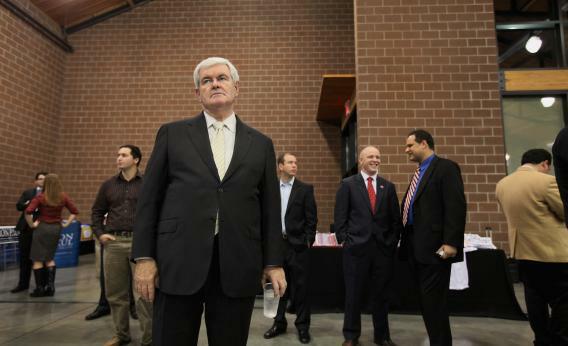 What Keeps Newt’s Bid Alive? Robert Costa is out with a before-it’s-conventional-wisdom take on the Newt Gingrich comeback. Because I’ve minimized the likelihood of such a thing, I am duty bound to link to strong arguments for it. The irony of Newt’s strength, according to Costa – he’s doing it by not trying to do it. [T]he campaign never attempted to engineer any grand comeback strategy, even when things were bleak and closing shop remained a distinct possibility. The immediate goal was surviving. During a normal week, Gingrich would appear at events — maybe a speech in Iowa and another in South Carolina — but he would never spend weeks on the trail, burning cash. The little things that lead to strong debates — reviewing news items and making sure Gingrich had a Diet Coke before he went on stage — became priorities for his aides. One qualm with this: It accurately describes what Newt’s campaign was like before the implosion. That was one of the indications that it wasn’t going well. The campaign exiles told Fox, back in June, that their candidate was spoiled and lazy. No longer would the candidate dictate the pace of the campaign, or have the option to beg off on crucial commitments whenever he pleased. Second, they wanted Gingrich to “back off” from continued screenings of “Nine Days That Changed The World,” the documentary the candidate and his wife co-produced about Pope John Paul II and which originally debuted in 2010. Newt’s comeback, such as it is, is happening as he holds a modest number of in-person events and basks in the free media of strong debate performances – which is what he always wanted. He’s not likely to win the nomination, but he never was! Honestly, there was no May 2011 Gingrich campaign strategy that was going to get him the nomination and then the presidency of the United States. That makes the whole discussion sort of strange. This comeback campaign remains $1 million in debt, after all.